Unto the woman he said, I will greatly multiply thy sorrow and thy conception; in sorrow thou shalt bring forth children; and thy desire shall be to thy husband, and he shall rule over thee. And unto Adam he said, Because thou hast hearkened unto the voice of the wife, and hast eaten of the tree, of which I commanded thee, saying, Thou shalt not eat of it: cursed is the ground for thy sake; in sorrow shalt thou eat of it all the days of thy life; Thorns also and thistles shall it bring forth to thee; and thou shalt eat the herb of the field; In the sweat of thy face shalt thou eat bread, till thou return unto the ground; for out of it wast thou taken: for dust thou art, and unto dust shalt thou return. With all the array of punishments laid upon mankind after Adam and Eve’s original sin doesn’t it seem strange that thorns are specifically mentioned here in Genesis? Of course, nothing is random in the Bible, nothing is written without significance; and again we find that this is the case. 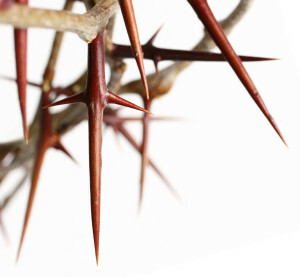 There are several references to thorns throughout the Bible each one reminding us of original sin and the curse. A fairly comprehensive list can be found at http://www.kingjamesbibleonline.org/thorns/. There are a few reasons why thorns are specifically mentioned as part of the curse on the world as a result of mankind’s original sin. Firstly, as believers in Genesis as literal history we would point out that thorns pose a problem for any Christian who does not hold to this view, that is, if the Earth took millions of years of slow and gradual processes to reach its current form then we would conclude that the thorns found in the fossil record are also millions of years old; and must have come BEFORE original sin which is obviously a big problem as you would have to reinterpret the plain reading of this text to allow for this. This is not a problem for Biblical Creationists as we believe the majority of the fossil record came about as a result of Noah’s flood which destroyed the earth as it then was. This was AFTER the original sin so we would expect to find fossil thorns in this case. Thorns are listed throughout the Bible in a negative way or as an obstacle which is a reminder of Sin, for example, “Thorns in your sides” (Numbers 33:55 & Judges 8:7) and another well known example would be in Matthew 13:3-8 (the Parable of the Sower) some seed “fell among thorns; and the thorns sprung up, and choked them:”. However the example most relevant is the crown of thorns that the governor’s soldiers put on Jesus head in order to mock him as the King of the Jews. 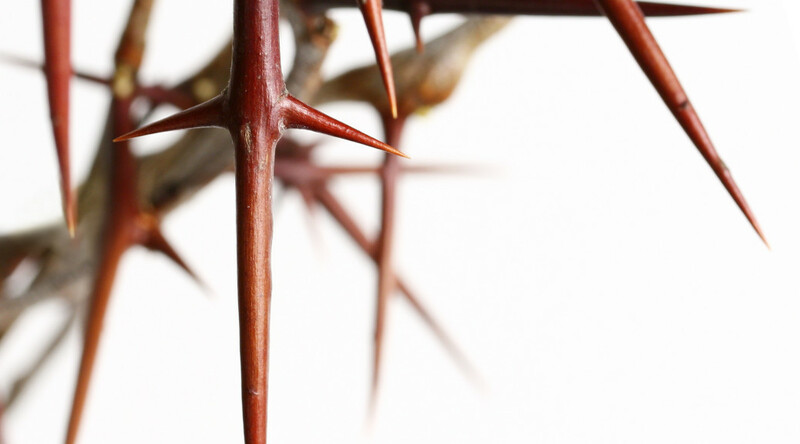 We don’t know if the soldiers realised the significance that they made the crown from thorns, one of the curses specifically mentioned in the Genesis account. However, we do know that it was hugely significant, it is a symbol of the original sin and all subsequent sin including our very own, a reminder to us of why Jesus went to the cross; it was to die as the perfect sacrifice for our sins so that the curse laid upon this earth can one day be removed for those that believe in him.